Although the modern geographical area of the state of Myanmar had been the seat of two powerful empires in ancient times, the modern state is of recent origin. Burman nationalist sentiment aside, the unified kingdom existed for only a brief period of 40 years between 1784 and 1824. Until that time the territory of Burma consisted of several kingdoms and a large number of principalities. The most important kingdoms were those of Ava, Pegu and Arakan. The Shan states on the eastern and southern borders, the Karenni and Mon states, all maintained a largely autonomous existence until the late 1950s. The dynasty that unified the kingdom is known as the Kon-Baung, or Alaungpaya dynasty. Their origins are obscure and even the immediate parentage of the founder is unknown. U Aung Jaya, a provincial military officer from the district of Shwebo, overthrew the King of Ava and crowned himself King as Alaung Min Thaya Gyi, in April 1752. He subdued the Shan kingdom of Pegu in 1757, but died three years later without clearly regulating a system of succession. This was to lay the seeds of instability for many years to come. Alaungpaya's eldest surviving son succeeded as King Naungdaw. He continued his father's expansionist policies by conquering Chiang Mai in 1763, but expired later that same year. His brother succeeded as King Hsinbyushin, perhaps one of the greatest in Burmese history. Shortly after his succession, the Chinese invaded. The war with the Celestial Empire lasted for four years between 1765 and 1769. His military genius was unsurpassed and culminated in the complete defeat of Siam in 1767. Nevertheless, he knew little of magnanimity, treating his foes with indescribable barbarity. The complete destruction of the Siamese capital of Ayudhya, remains one of the most infamous in history. Dying in 1776, he left his throne to his eldest son, Singusa. However, his succession remained unpopular with Alaunpaya's remaining powerful sons. Maung Maung, a son of Naungdaw, took advantage of this disaffection by seizing the palace and deposing Singusa in February 1782. His uncle Bodawpaya, the fourth son of Alaungapa, quickly took control of the country and seized the throne for himself. Crowned in as King Hsengbyumya Sheng, Bodawpaya finally succeeded in unifying the country by destroying the Muslim kingdom of Arakan in 1784. By extending his borders to the territories of the HEIC in Bengal, Bodawpaya laid the seeds for friction and conflict for the next century. Relations with the other, hitherto independent principalities of Manipur and Assam remained friendly during his reign, but soon soured. By the 1820's, Bodowhpaya's grandson, King Bagyidaw, had begun military incursions into both states, interfering in their internal and playing kingmaker. This did not please the British authorities in Bengal, relations progressively worsened, eventually leading to all out war in 1824. Faced with an overwhelmingly superior enemy with modern technology and methods of warfare, Burma capitulated after a relatively brief campaign. They surrendered Ava, agreed to a Ј1 million pound compensation, and annexed Tenasserim and the Arakan to British India in 1826. Weakened by his defeat, Bagyidaw faced dessention from his own family. His brother, Tharawaddy, gathered a powerful army, took the capital and forced his abdication in 1837. 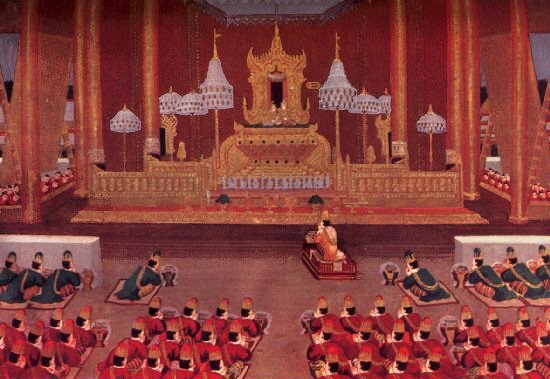 King Tharawaddy reigned for nine years and died in 1846. Pagan, his eldest son succeeded but also fell foul of the British. Relations ruptured again, leading to the second Anglo-Burmese War in 1852. The results were hardly different this time. Defeat led to the annexation of Rangoon and Lower Burma. The King lost face, his younger brother rebelled and seized the throne, in the following year. King Mindon, was in many ways a model ruler, who genuinely had the best interests of his subjects at heart and tried desperately to modernise his country and to maintain cordial relations with his neighbours. Students were dispatched to various European capitals and diplomatic relations established with the European powers. However, internal dissension and succession disputes were rife. The most severe being a palace revolution in 1866, the Crown Prince and several senior members of the Royal family were killed. King Mindon himself died peacefully in 1878. Although leaving over one hundred children by numerous wives and concubines, he too failed to secure the succession. As the king lay dying, his last days were rife with intrigue as competing groups plotted to establish their own candidates on the throne. Thibaw, a relatively junior prince, emerged as successor, largely due to the machinations of the palace women. Insecure in his position from the outset, he, or wife and mother-in-law the Sinbyumashin Queen, set about disposing of any potential rivals to the throne. Fourteen brothers and four sisters, together with sixty-one other relatives, met their deaths over a four-day period in February 1879. Although such massacres had been a feature of previous successions, this surpassed all precedents. Many of those who lost their lives were mere babes in arms, their heads bashed against the palace walls. Those not killed within the specified time were buried alive with the others in a large pit, then flattened to death by elephants. The Nyaungyan and Nyaungok princes and their families escaped to the British Residency and were smuggled out in a gunboat. Thibaw quickly fell under the dominance of his wife, Queen Suphayalat. She was cruel and tyrannical, when she 'lifted up her little finger, the whole city trembled'. Relations with the British deteriorated rapidly as the new regime sought to establish control over his people and foreigners alike. They blockaded the Residency and evidence emerged of a plot to massacre the inhabitants. At the same time, the merchants of Rangoon, long envious of Royal monopolies that restricted trade started agitating for annexation. Attempts at strengthening relations with France, coming soon after their recent annexations in Indo-China, simply antagonised the British further. The Viceroy of India issued an ultimatum which, in effect, called for a British protectorate. In a show of bravado, Thibaw rejected the ultimatum and declared war in 1885. The outcome was as inevitable as the last two. Thibaw was defeated, Mandalay conquered and looted, the kingdom extinguished and the remaining provinces annexed. King Thibaw and his immediate family went into exile in India. The Viceroy of India issued a formal proclamation annexing Upper Burma on 1st January 1886. Ex-King Thibaw ended his days in a small brick palace at Ratnagiri, in the Bombay Presidency in 1916. None of his sons survived infancy, only four daughters. Two of them returned to Burma on government pensions but ended their days in poverty. The government of independent Burma put a stop on these pensions in the "national interest". Burma: The Myingun Prince and Family 1907-1922. Political and Secret Dept., Government of India. Oriental and India Office Collection, British Library, IOR (L/PS/10/232). Burma: Affairs of the Limbin Mintha and family (also other descendants of King Mindon Min) 1912-1926. Political and Secret Dept., Government of India. Oriental and India Office Collection, British Library. IOR (L/PS/10/213). W S Desai, Deposed King Thibaw of Burma in India, 1885-1916. Bharatiya Vidya Bhavan, Bombay, 1967. Historical memorandum of Royal relations of Burmah hunters family, from beginning to present 1228. Yedanabhoom (Mandalay) 4th December 1866. India. Oriental and India Office Collection, British Library. Sir Arthur Phayre Collection of Oriental Manuscripts (OR. 3470). William J Koenig, The Burmese Polity, 1752-1819. Politics, Administration and Social Organisation in the Early Konbang Period. Centre for Southeast Asian Studies, The University of Michigan, 1990. Myo Myint, The Politics of Survival in Burma: Diplomacy and Statecraft in the Reign of King Mindon, 1853-1878. A Thesis Presented to the Faculty of the Graduate School of Cornell University, May 1987. Report of the Committee Appointed to examine the question of instituting a new system of awarding Titles and Decorations and to review the present Designs of Uniforms and Badges of Rank for the Armed Forces of the Union and for certain Civil Departments. Supt., Govt. Printing and Stationery, Rangoon, 1949. J. George Scott (comp. ), Gazetteer of Upper Burma and the Shan States. Vols. 1-V. Superintendent of Government Printing, Rangoon, 1900. Than Tun (ed). The Royal Orders of Burma, AD 1598-1885. The Centre for South East Asian Studies, Kyoto Univ., 1988.